Welcome to my new site, PatSajakGames.com! Books, magazines, downloads, mobile games, online games, CD-Roms and more. No wonder I'm exhausted! We're working hard to make PatSajakGames the place to come to get the latest and greatest games, no matter how you like to play them. 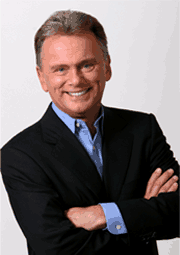 Pat Sajak's Lucky Letters has become one of the hottest online games, and thousands of players have purchased it. Our newest game, Pat Sajak's Trivia Gems, has gotten off to a great start. And our next title (a secret for now) is coming up soon. Our puzzle books and magazines have been selling out around the country, and more titles are on the way. So be sure to bookmark our site, and check back often. I'll be standing here waiting for you with my arms folded, wearing this cool blazer and silly grin. Thanks for visiting, and stay tuned for more. P.S. - I'd also like to give a special welcome to all of the Wheel Watchers Club members!